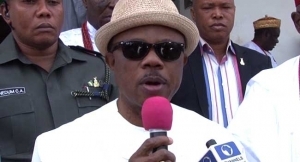 Governor Willie Obiano, on Wednesday commissioned the Onitsha Shopping Mall in Anambra State, southeast Nigeria. Commissioning the project amidst fanfare and celebration, Governor Obiano restated the major blueprint of his administration which includes trade and commerce. He noted that his target was for the people of the state to begin to enjoy shopping activities in the best environment with quality and standard being the hallmark. The Governor added that the mall, which already has heavy security presence, would have two additional Police patrol cars while the Ministry of Works would commence the construction of an exit route at the back of the mall for easy accessibility in and out. Commissioning Shoprite Mall which is an anchor tenant, the Governor expressed hope that among other things, the mall would decongest the open market, break shopping traffic from Anambra to other states and attract more investors for increased revenue generation. In his statement, the Development Manager of Capital Alliance, Osita Okonkwo, said that the project was a shining example of what could be achieved when a proper synergy exists between government and private investment partners. Onitsha Mall is the largest retail shopping center in Onitsha and one of the most iconic malls in Anambra State and it was initiated by the immediate past administration.